It’s always such a joy to return to Wilmington, NC … where Ben first launched his art career! Alison and Rally’s felt like a client reunion because Ben had painted for so many of the guests whether live at an event or a commissioned house portrait. Needless to say, Ben had an absolute blast celebrating with Alison and Rally. 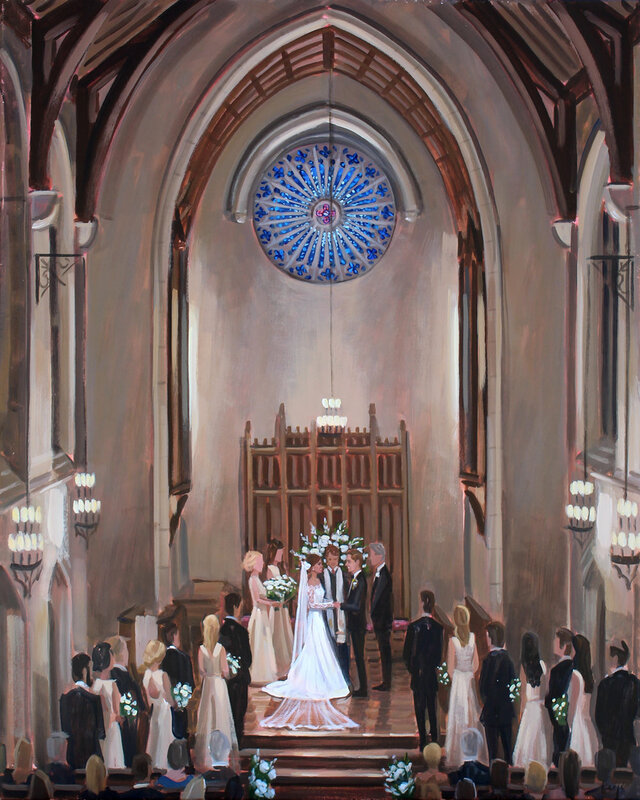 They chose their ceremony as the subject of their live painting, highlighting their bridal party as well as the gorgeous architecture and stained glass of First Presbyterian Church. Architecture is one of Ben’s favorite backdrops to paint. There’s so much measuring and design involved that he finds it to be an exciting challenge. Needless to say, we’re thrilled to share their finished live wedding painting! Alison + Rally commissioned live wedding painter, Ben Keys, of Wed on Canvas to capture their ceremony held at downtown Wilmington’s First Presbyterian Church. Live wedding painter, Ben Keys, captured Heather + Jake’s dreamy first dance at historic Richmond’s John Marshall Ballrooms.